Just stayed at Fraser for 3 nights after the last visit in April 2012. Reasons for choosing it again were because of its excellent location and spacious suites. As this hotel gets more and more popular, it becomes very difficult to book package deals at reasonable rates. As a result, I was closely monitoring their website and once they released the room rates around 2 weeks before the next month, I tried to book the 3 consecutive nights at almost the lowest rates and get the air tickets separately. Now it seems lowest room rates were around ¥26k and for some hot dates, the room rates were priced at ¥71k. However, in severe winter months of January, noticed the room rates can drop to ¥17k. Once I booked the rooms, I wrote to Fraser and enquired whether they had walk-in shower as my mom's mobility is not so convenient to climb into the bath tub. They replied very quickly to tell me that they didn't have walk-in shower but they could offer a disabled room for our use. They sent pictures which showed the bathroom was much bigger and I reckoned my mom could take a shower just next to the bath tub with water properly flow back into the drainage system. I decided to switch the room and they offered a reduced room rate at ¥19k per night. I had also reserved for a plastic chair to be used...Just stayed at Fraser for 3 nights after the last visit in April 2012. Reasons for choosing it again were because of its excellent location and spacious suites. As this hotel gets more and more popular, it becomes very difficult to book package deals at reasonable rates. As a result, I was closely monitoring their website and once they released the room rates around 2 weeks before the next month, I tried to book the 3 consecutive nights at almost the lowest rates and get the air tickets separately. Now it seems lowest room rates were around ¥26k and for some hot dates, the room rates were priced at ¥71k. However, in severe winter months of January, noticed the room rates can drop to ¥17k. Once I booked the rooms, I wrote to Fraser and enquired whether they had walk-in shower as my mom's mobility is not so convenient to climb into the bath tub. They replied very quickly to tell me that they didn't have walk-in shower but they could offer a disabled room for our use. They sent pictures which showed the bathroom was much bigger and I reckoned my mom could take a shower just next to the bath tub with water properly flow back into the drainage system. I decided to switch the room and they offered a reduced room rate at ¥19k per night. 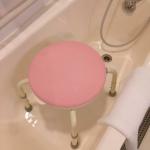 I had also reserved for a plastic chair to be used in the shower. Upon arrival, we were being shown to our room. As the size of the room was only 28 sqm and the disabled bathroom took up about 50%-60% of the room size, it felt rather cramped given comparison to the other room I had stayed before. Besides the twin beds, there was a small bench as working table with TV on top and other facilities like cooking stove, microwave, washing machine were still there. Just that the refrigerator was like the size of a minibar. Very soon I went to the reception to check availability of the other suites with size of 40-44 sqm. Noriko-san was very helpful and advised that the first two nights were available but there was no room for the third night. There was one smoking room which was available for 3 nights but with only 1 double bed. After checking it out which the bedroom was just half the normal size and the double bed was right next to the wall, I decided to change to a normal suite and willing to move back to the disabled room if there was no availability for the final night. Noriko-san checked the latest room rate which had gone up to ¥29k, however, she was very kind to give us back the original room rate of ¥26k and even helped us moved the luggage to the new room. On the 3rd day, she told us we could stay in the same room which was most welcome and highly appreciated. In my 2012 review of the hotel, I wrote that the receptionists were very cool then and needed improvement. This time I noticed remarkable difference and all receptionists were extremely helpful. Besides improved English, they were very familiar with most restaurant and shopping areas. Once we enquired about certain restaurants, they would looked into the computers to check latest information and offered to make reservations for us. Also one morning I noticed two receptionists were standing outside the hotel, one was directing the hotel guests about the direction where they wanted to go and another one was trying to catch a taxi for the guests. Another improvement was the additional restaurant for breakfast where breakfast time was extended to 11 a.m. with an additional 10 breakfast sets. Free Wifi in room worked faster with mobile phone than computers. There were also many TV channels and for the international channels like BBC, CNN, CNBC etc., language could be switched back to English through the video operating system. Only small short coming was that the Chinese channel CCTV didn't seem to have any reception during our stay. The Residence is located closed to the Namba Nankai station. If you take Nankai rapid train from Kansai International airport, it just take you less than an hour to the Residence. The room we stayed is a one bedroom suite equipped with a full size bathroom, a bedroom with king size bed, a walk in closet with iron board and safe, two TVs, a living room with a big sofa, dining table with chairs, a fully equipped kitchen, and a washing/drying machine. The room is clean and tidy. Free wifi is a plus. The Residence is sweet to place us a gift and greeting card for our anniversary! One downside is that the Residence is not very closed to the Sinshabashi shopping street; you will need to walk 15-20 minutes from the Residence to the hot shopping street. Yet, the Namba shopping malls and department store is closed by. 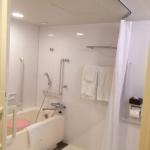 Another 3 nights of delightful stay 25-28 Sep at Fraser Residence Nankai Osaka! Clean comfortable spacious room, tastefully decorated and tip top service from the moment we arrived with late check-in - warmly greeted at check-in, to every detail from giving us directions on what to see, where to shop, where to eat, what is available nearby, transportation etc... always ready to provide advise and ideas and very accommodating to our needs. The location is GREAT - very central to shopping and food and next to JR and Subway. Again, this is not my first visit to a Fraser's accommodation, but the tip top service and great accommodation has been the driving force to keep us coming back to stay at Fraser's in various countries. A very good choice in a great location I must say! Room tip: The rooms are generally good regardless of floor or location. Front desk staff was efficient. Suggested I spend resting time in their lounge while waiting for my midnight flight after check-out. Good customer experience. Staff also speak good English, very helpful, friendly and informative. Room standard was great too. Everything is modern, minimal design and complete with basic residence amenities. Location of hotel is very strategic. Public transportation and shopping malls are nearby. A minute walk to Osaka's famous - Namba station with easy access to main line like Nankai & JR, Namba Parks, Namba Walk, I0I City, Namba City, Dotombori, Shinsaibashi etc. McDonald is just in front the hotel. Lots of cafes and restaurants downstairs. Will recommend hotel to others. Definitely. Good job Fraser Residence Nankai! Location was great, staff was friendly, a great overall experience. The staff and location is top notch. Rooms is apartment style so is not going to be fancy but what I expected. All the supporting appliances were really great except for the wifi which was terrible. The cleaning staff was below average, the furniture and carpet could be a little cleaner if we are comparing to Japanese standards.